Holy MOLY this book! Second book syndrome? Ha! 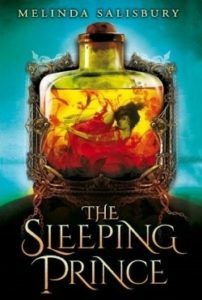 The Sleeping Prince starts off with a new character, Errin (Leif’s sister), after the events of The Sin Eater’s Daughter. Left alone to care for her sick mother, Errin barely scrapes by making poisons for her enigmatic and only friend, Silas. However, when the threat of war looms near, she must go on an epic journey to get what she needs to save her mother and hopefully bring her brother home. What she discovers though will forever change the course of her destiny and those she loves. Ok, I’m going to be completely honest here. I COULD NOT for the life of me remember how The Sin Eater’s Daughter ended. I had a general idea of the plot, but it’s been awhile! I couldn’t remember the details of the ending and it was DRIVING ME INSANE. Sometimes I just don’t have the time to reread a whole series before the sequel comes out! I actually had to call my speed reading demon friend Jenn and have her read the last few chapters to tell me what happened. In a way though, you kind of didn’t need to know what happened previously (besides the obvious points that I already remembered) because with the new characters, it read as a completely new novel for me–one that was AWESOME. Errin was so baddass. And I don’t mean that in the get *hit done kinda way, although that happens. No, I mean that she is willing to beg, borrow, blackmail, steal, and do whatever it takes to get what she wants to help her family. It was such a contrast to Twylla from the first book who I constantly found a bit lack luster and just never making the right choices. I loved Errin because of that. She does have some morals however which shine through as she goes on her journey. Silas. What a character. I wasn’t expecting his plot to go the way it did, but I adored the twist. The relationship between the two of them is fraught with trial and tribulation, but they worked. It was completely romantic and believable and had you rooting for them from day one! We eventually see some of the characters from the first installment and it gives way to feeling all the feelings. The plot helps in that matter as well. Melinda Salisbury does it again with the twists in this one. OMG. I don’t know what else to say about it without giving too much away. But believe me, you will keep reading until the wee hours in the morning and the ending will have you waiting with anxious breath until the final installment comes out. Pick this one up, but I do suggest reading The Sin Eater’s Daughter if it’s been a while like me. There are a few things that would be helpful to remember! Once you do though, READ THIS IMEDIATELY and then flail all the flails.